Philippine military officials said Wednesday that they've asked social media companies including Facebook to remove a video of militants smashing icons in a Catholic church in a besieged southern city, saying it may be an attempt to fan hatred and turn the conflict into a religious war. Brig. Gen. Restituto Padilla, the military spokesman, also urged netizens not to share the video, which shows militants ripping a picture of Pope Francis, toppling a crucifix, and stomping on and torching religious statues. Militants aligned with the Islamic State group continue to control pockets of territory in Marawi, where they laid siege more than two weeks ago. They are believed to be still holding a Catholic priest and many other hostages. "We requested that this be pulled out because it may fan hatred," Padilla told reporters. "It is intended by these militants to ... sow hatred among Christians and Muslims." He urged social media users not to spread the video and not to "buy into the plan of these groups to inflame the feelings" of followers of various religions in the predominantly Catholic country. "This is not a religious war, this is a terror attack on the city of Marawi, and we must be clear about it," Padilla said. He said those killed since the fighting broke out on May 23 include 20 civilians, 134 militants and 39 government troops. More than 1,500 civilians have been rescued. The militants' "world is continuously growing smaller and smaller every day," Padilla said. 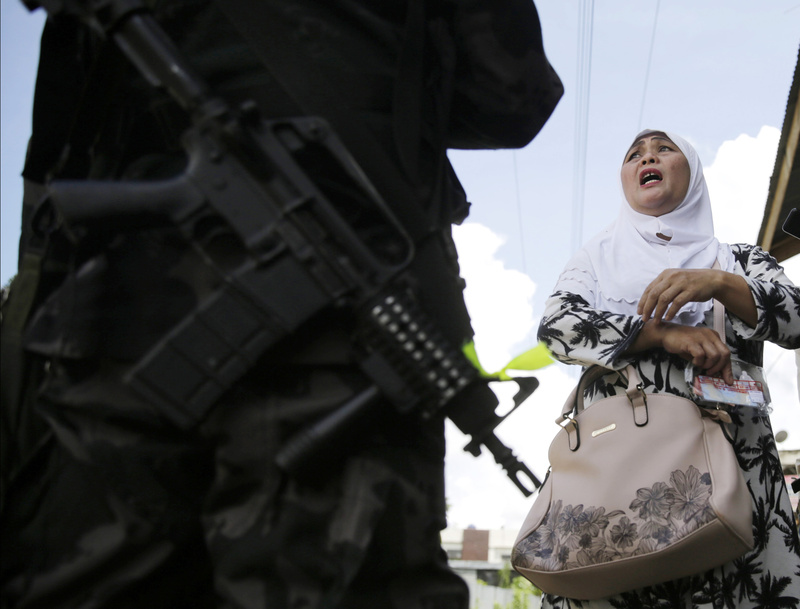 Police and military operatives arrested several suspected militants Tuesday outside of Marawi. Those arrested include Cayamora Maute, the father of three brothers who are among leaders of the Marawi siege and who himself is wanted by authorities. He, his second wife, a daughter, a son-in-law and a driver were apprehended at a checkpoint in southern Davao City, officials said. Security forces also arrested suspected militant Kamarudin Butocan Raquiab in a raid on his safe house in southern Maguindanao province's Odin Sinsuat town, where an IS flag, assorted firearms and four improvised bombs were found.